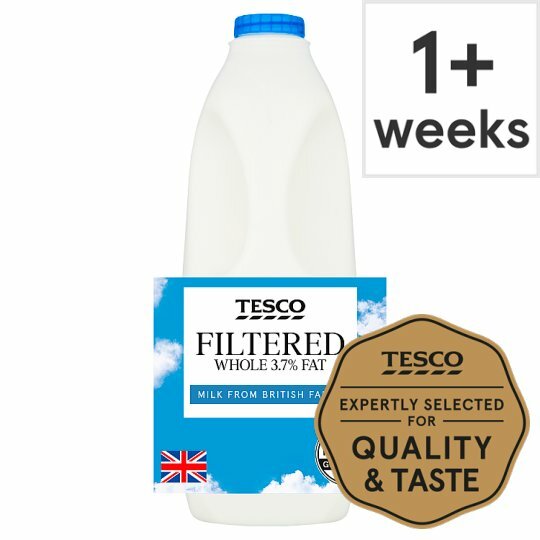 Pasteurised standardised homogenised filtered whole milk. Fair For Farmers Guarantee We Promise Every farmer is paid fairly for every pint of milk Every pint is 100% British Every cow is well cared for For more information go to www.tescoplc.com/little helps plan/ FROM BRITISH FARMS Filtered to stay fresh for 7 days once opened Our filtered milk stays fresh for twice as long as standard milk. We do this by passing our milk through ceramic filters that remove the bacteria which turns milk sour. We do not use preservatives nor additives and make sure that all the dairy goodness is retained. Keep refrigerated. Once opened consume within 7 days and by 'use by' date shown. Keep upright.